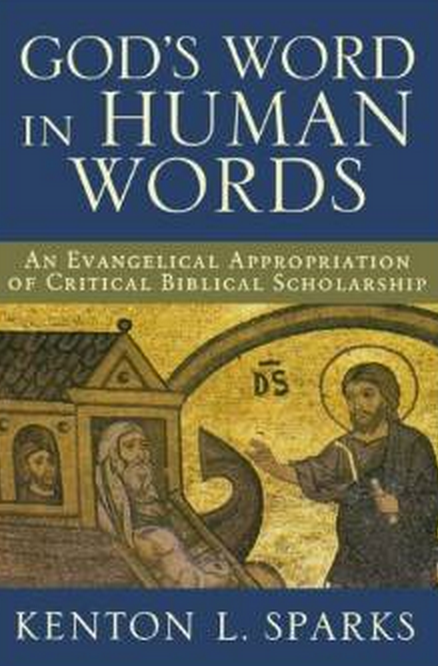 Kenton Sparks, professor of Biblical Studies at Eastern University—an evangelical school by confession—has recently offered his contribution to an evangelical doctrine of Scripture in God’s Word in Human Words: An Evangelical Appropriation of Critical Biblical Scholarship (GWHW). As the title of the book suggests and as he states clearly in the introduction, Sparks situates himself within the evangelical tradition, so he approaches his work from a “profound appreciation” for evangelicalism’s “doctrinal commitment to the inerrancy of God’s Word” (22). But Sparks is concerned over evangelicalism’s approach to assessing and using critical biblical scholarship and he considers himself as one of several emerging evangelical scholars who find the “standard critical arguments” for problems in the Bible offered by modern academics far more satisfactory than those posited in most evangelical efforts (12). Sparks begins his volume by surveying briefly the broad contours of the history of biblical interpretation, commencing with the pre-modern period and concluding in the contemporary period (chapter 1). He then examines the academic discipline of Assyriology and its relationship to historical criticism and the Bible (chapter 2). From these two studies, Sparks draws important conclusions that frame, in large measure, much of his remaining argument. First, with regard to matters of hermeneutics, Sparks notes that finite human nature is a good gift from God that enables human beings to recognize the profound difference between their knowledge and God’s knowledge. God’s knowledge is perfect, comprehensive, unconditional, unmediated; human knowledge is imperfect, limited, historically and culturally conditioned, and mediated through various sources. It is foolish—even dangerous—therefore, for humankind to attempt to achieve a “god-like grasp” on truth that assumes a status of epistemic exhaustiveness (54). Second, Sparks observes that interpreters, given that they reside in a particular place in history, are inevitably influenced by the exegetical and hermeneutical practices of their time. Depending when biblical interpreters lived, they might seek the plain or allegorical meaning in a text, or concern themselves chiefly with historical issues, or give little to no attention to an author’s intended meaning. It seems safe to assume, then, that this hermeneutical “situatedness” affected Paul as well as Augustine (54-55). Is it therefore possible that God has selected to speak to human beings through adequate rather than inerrant words, and is it further possible that he did so because human beings are adequate rather than inerrant readers? Might it be the very height of divine wisdom, of inerrant wisdom, for God to speak to us from an adequate human horizon rather than from his divine, inerrant viewpoint (55)? Such questions lead Sparks to conclude that the Bible itself—rather than prior assumptions about the nature of Scripture—must tell us what kind of revelation God has provided his people. Despite these questions, Sparks states that he “will strongly support the doctrine of inerrancy when it comes to Scripture” (55), but a version of the doctrine that is different than traditionally understood. Concerning matters of Assyriology and historical critical scholarship (chap. 3), Sparks establishes several important conclusions that will inform his study of the biblical texts throughout the remainder of his book. He observes from his study of several ancient Assyrian texts, for example, that (1) certain ANE narratives may have the appearance of an historical record but may instead be fictional; (2) these texts reflect the limited perspective of their authors; (3) they can sometimes contain “pseudoprophesies” and historical fabrications that fit the “propagandistic needs of kings or priests” (71); and (4) they are often the work of several authors and redactors who would modify the texts as they made their way from generation to generation. The bulk of Sparks’s work from this point is an interaction with biblical texts that pose problems for the modern reader because many of the assertions in, and the implications of, these texts have been challenged by the findings of historical criticism. As he walks through these texts, Sparks shows the multitude of ways historical criticism aids in providing plausible explanations of Bible difficulties and generally informing an evangelical theology of Scripture that deals honestly with text of Scripture itself. Throughout his study, and particularly in chapter 4, Sparks evaluates traditional approaches to the discoveries of historical scholarship and judges a large swath of evangelicals lacking in their approach to the problems posed by such scholarship. Sparks departs from these so-called faulty evangelical approaches to historical criticism and develops his “constructive” method alluded to earlier in his book. Indeed, Sparks notes that the evidence provided by historical-critical scholarship has challenged the long-held traditional assumptions about the Bible and has recently brought many evangelical scholars to embrace more broadminded approaches to Scripture (170). Sparks argues that constructive responses to biblical criticism allow for better answers to the problems posed by historical scholarship. For example, classifying some sections of Scripture under the category of myth, legend, saga, and allegory allows for many of the Bible’s difficulties to disappear (202). According to Sparks, God, in using these various genres, accommodated himself to “mistaken viewpoints” of the time in order to communicate his message to humanity (203). In the end Sparks desires to maintain the human component of Scripture as a vital aspect of an evangelical doctrine of Scripture (227). Sparks recognizes that his proposals incite a significant theological problem related to God and the authority of the Bible. He asks, “how does the Bible speak as the authoritative voice of God if it includes diverse and sometimes contradictory perspectives of its human authors” (227)? Sparks turns to the category of accommodation in order to answer this question, defining accommodation as “God’s adoption in inscripturation of the human audiences finite and fallen perspective” (230. See also 229-59; 277-78; 326). Sparks then turns to apply his arguments to specific passages of Scripture. Although he is unable to conduct a comprehensive analysis of these passages, he seeks to provide examples of how the method outlined earlier in the book leads to his exegetical and theological conclusions (356). Sparks concludes his work by offering suggestions as to how his method of assimilating the findings of historical research with the teaching of Scripture should be brought to bear on the ministry of the local church and evangelical institutions of higher education. It should come as no surprise that Sparks has seen significant response to his work. The responses have come chiefly in the form of book reviews and the weighty volume, Do Historical Matters Matter to Faith—a compilation of articles that considers the matter of the historical reliability of Scripture generally and Sparks’s work specifically. While offering commendations of Sparks’s broad knowledge of historical-critical studies, his ambitious attempt to meld biblical scholarship, background inquiries, theology, epistemology, and exegesis into a unified contribution to the evangelical doctrine of Scripture, and his desire to look unflinchingly at the evidence offered by historical research, many conservative scholars have found Sparks’s overall project plagued by significant problems. The first problem with which critics of Sparks take issue is his introductory discussion of epistemology and hermeneutics. In this section his critics argue that he fails to establish a fundamental tenet for the rest of his project. Throughout GWHW, Sparks builds his argument for an errant Bible on the supposition that Scripture, as a human product, must contain error (55, 171, 225-26, 252-54, 298-99); yet, he never demonstrates the validity of this logical move. As Thomas McCall notes, it is assumed throughout the book that “the property of being said or authored by a human entails the property of being mistaken” (Historical Matters, 50), yet Sparks never provides any reason why one should accept error as a necessary entailment of human speaking or authorship. Indeed, there are good reasons to reject this move, as it can be shown rather easily that finite humans can produce correct statements on a host of issues. Sparks also appears to misunderstand the evangelical doctrine of inerrancy to equate error-free knowledge with exhaustive knowledge. Thus, when evangelicals claim inerrancy for Scripture, their claim is immediately suspect because such a position implies that a person is able to attain to comprehensive, “god-like” knowledge (57). Sparks faults evangelicals for falling into an illegitimate Cartesian epistemology where the search for certainty assumes that human beings have the ability to perceive the world the way God does. Yet, the evangelical doctrine of inerrancy assumes no such thing, nor is it correct to locate the blame for evangelicalism’s quest for certainty at Descartes, for the language of certainty is found early in church history. Furthermore, Christian theologians have argued recently, in light of postmodernism’s suspicion of universal truth claims, that a limited perspective does not necessarily preclude the acquisition of true knowledge. In other words, one may know something truly, even if not exhaustively (think of D. A. Carson’s argument in The Gagging of God, for example). Sparks, however, does not allow for a limited-yet-true kind of knowledge, nor does he demonstrate that such evangelical discussions of epistemology exist. One can also apply these epistemological considerations to Sparks’s Christology. That is, contrary to Sparks’s argument that Jesus, as a human, was sometimes mistaken in his assertions about various matters (thus leading to the conclusion that the Bible’s human authors must also err, see GWHW, 252), one can say that the property of existing as a human does not necessarily imply the property of mistake-making. Sparks might counter this objection by suggesting Christ’s possession of a fallen human nature would seem to imply that error is something to which Christ, at times, might succumb; this explains why we see mistakes in some of Jesus’ historical, botanical, and geographical statements, and certain affirmations of Old Testament authorship (see 252n67). If so, Sparks does not adequately demonstrate that Christ did, in fact, possess a fallen nature, or that the tradition demands that we formulate our Christology in this way. Indeed, persuasive arguments have been offered to establish that the property of being human does not entail the property of fallenness (consider Oliver Crisp’s outstanding work in Divinity and Humanity). Sparks fails to interact with these arguments, nor does he give the impression that there is a strong case for a viewpoint other than his own. He does not, therefore, consider that it is possible that Jesus could be truly human while also avoiding error and mistaken human viewpoints. Thomas McCall also observes that Sparks’s version of a “mistaken Jesus” does not comport well with classical or contemporary Christological models that fall within Chalcedonian parameters. In other words, neither the medieval christologies that state that Jesus’ human soul had full access to the “beautific vision,” nor Thomas Morris’s “two minds” model that allows for the interrelation of an infinite divine mind and a finite human mind appear to allow for the notion that Christ would have made mistakes during his time on earth. It seems, then, that only those Christological models that fall outside Chalcedonian boundaries are able to provide a paradigm for the kind of “mistaken Jesus” that Sparks proposes. The burden would be upon Sparks, then, to demonstrate why the church should move away from such a foundational confession on the nature of Christ. Finally, Sparks demonstrates an inadequate understanding of accommodation when he appeals to this theological category to bolster his case for an errant Bible. He observes that the church since its inception has utilized the doctrine of accommodation to account for the diversity of Scripture. Sparks defines accommodation as “God’s adoption in inscripturation of the human audience’s finite and fallen perspectives. Its underlying conceptual assumption is that in many cases God does not correct our mistaken human viewpoints but merely assumes them in order to communicate with us” (230-31). According to Sparks, although God adopts mistaken human viewpoints in order to convey his message to humans, he does not err in doing so (256). He appeals to Calvin in order to undergird his understanding of accommodation and then draws from several theologians from church history further to strengthen his case. From here he turns to critique two evangelicals—Wayne Grudem and Carl F. H. Henry—who, in his judgment, leave no room for the idea of accommodation in Scripture (247-55). The major problem afflicting Sparks’s discussion in this section is that he first misunderstands the historic articulation of accommodation and then uses this flawed interpretation to argue that conservative evangelicals typically reject the idea of accommodation. Ironically, rather than following church tradition on the matter, it is Sparks who embraces a Socinian framework where accommodation is understood as God’s adaptation to the errant viewpoints of the biblical authors (see Historical Matters, 16). The claim that this particular version of accommodation was the position of the early church and the reformers was thoroughly challenged by historian John Woodbridge (see Woodbridge’s volume, Biblical Authority: A Critique of the Rogers/McKim Proposal). It is a logical fallacy, then, to say that because evangelicals do not embrace this form of accommodation that they therefore reject the idea of accommodation altogether. It is a particular kind of accommodation that evangelicals like Grudem and Henry reject; namely, accommodation of the Socinian variety. Evangelicals do, however, advocate a view of accommodation that recognizes God’s gracious condescension to use language with which his creatures were acquainted but that does not consent to the idea of errors in the text. It is this version of accommodation that aligns with the historic position. The Socinian view of accommodation was rejected for the very reason that it allowed for errors in the biblical text. Furthermore, Sparks’s presentation of the church fathers and of Calvin never actually proves these men embraced and promoted a version of accommodation that allowed for error. In his survey of Calvin, Sparks simply appears to misunderstand the Reformer or to take his words out of context; the examples he provides of the church fathers all could fit comfortably under the evangelical version of accommodation. Perhaps most alarming is the fact that Sparks never interacts with nor mentions Woodbridge’s volume in his entire book. In summary, Sparks’s ambitious attempt to provide a well-argued framework that integrates critical scholarship into an evangelical doctrine of Scripture fails because of the foundational problems noted above. Yet, I cannot stress enough that this discussion is much more than an academic exercise, relevant to only a few scholars. Sparks indicates in GWHW that he desires to introduce his view of Scripture and his approach to historical-critical studies to the church and to Christian universities. Pastors who care for the spiritual well-being of their flock and parents who desire their students to emerge from their years in college with a well-grounded trust in God’s Word should make it a priority to inform those under their care of the errors propounded in Sparks’s book. Amen, Derek. Thank you for this pertinent review. The Bible is unequivocal that it is the word of Christ (Rom. 10:17; Col. 3:16) and that believers have the mind of Christ (1 Cor. 2:16). Therefore, we can presume that true believers throughout all ages can understand Christ’s word using Christ’s mind, as facilitated by the Holy Spirit. Note to Sparks: the Holy Spirit aids true believers in understanding the inerrant text He wrote, and will continue to do so until the return of Christ.